NOFA-NY has a long history of collaborations, as all programs and projects flourish when working in partnership. Whether it is farmer to farmer education, specific projects with education institutions, or joint policy initiatives, collaboration is at the heart of much of the work we do, as we are a community of farmers, gardeners, consumers, educators, and organizations. Below is a sample of building an organic New York! Appropriate Technology Transfer for Rural Areas (ATTRA). For about a decade during the tenure of Representative Jim Walsh, (Congressional Rep from Central NY), NOFA-NY and the New York Sustainable Agriculture Working Group (NYSAWG) annually pulled together farmers in the district to successfully lobby Rep. Walsh to be the lead champion of a well-used technical assistance program for farmers: Appropriate Technology Transfer for Rural Areas. Every year, ATTRA was zeroed out in the budget, and every year, we would meet with Rep. Walsh, and encourage farmers to meet and make phone calls to ask him to get it funded. While he often told us he wasn’t interested in supporting conservation programs, he always came through, and he eventually became a supporter of organic agriculture. This happened only as a result of collaborating with NYSAWG and activating organic farmers in his district. New York Organic Action Plan. Over an eight year period, volunteer members of the NOFA-NY Policy Committee collected input from people across the state who care about an organic future. With waves of activity and spells of dormancy, the process involved hundreds of people through web-based questions and face to face brainstorming sessions. After discussing what is working, what is not working and then putting those ideas within the context of change, an overall goal was set to move New York’s Organic Action Plan forward: Create an ecological New York State where healthy food and access to land are considered human rights. 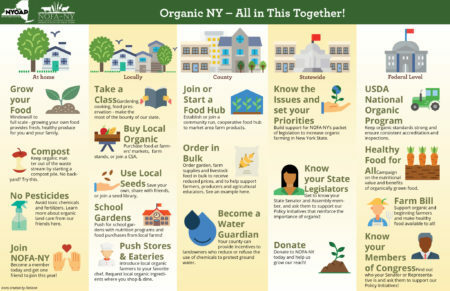 NOFA-NY created an infographic so everyone can make a difference and implement the New York Organic Action Plan. We will be presenting this plan to the organizations with whom we worked on GMO labeling for their endorsement and support. Food Safety Outreach Project. In response to the Food Safety Modernization Act, NOFA-NY partnered with Cornell University, NOFA-VT, and University of Vermont to develop the Food Safety Outreach Program to expand Food Safety education to small and mid-sized farms in New York and Vermont. Through support from the USDA National Institute of Food and Agriculture, the four partners compile the best training materials, develop curriculum, and conduct on-farm workshops to educate farmers about Food Safety in order to help them create their on-farm Food Safety Plans. Neighborhood Shares Program. In collaboration with local Community Supported Agriculture farmers in Rochester and Buffalo, NOFA-NY provides affordable CSA memberships to low-income community members so everyone has access to fresh local produce. NOFA-NY Field Days. Since 1983, NOFA-NY has collaborated with organic farmers to conduct farmer to farmer education. Over the course of the years, NOFA-NY has worked with 100s of farmers to spread the knowledge of organic farming techniques through high tunnel use, dairy management, food safety, and carbon farming, to name only a small handful of the methods that enhance organic farming. Only in partnerships can we grow local organic food and farm communities across the state, region, country, and world!